An extensive e-book (which you can read online free) that covers the differences between ECMAScript 5 and 6, aimed at developers already familiar with ES5. It's a work in progress but there's already a lot to enjoy. A beginner-oriented tutorial on using Facebook’s React library and its XML-like JSX syntax for templates and output. 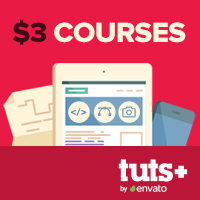 This Cyber Monday only all video courses on Tuts+ will be reduced to just $3 (normally $15). Don’t miss out. What's in a Function Name? A humorous comparison of strong and static vs weak and dynamic typing. Implements some of the most common array methods in a different but faster way, resulting in arrays with increased performance. An 8 minute look at generators and how they can relieve any tension you might have with callbacks. A look at what 8 different compatibility tables have to offer. Open source plugin that turns Visual Studio into a powerful Node.js IDE. Not new, but now jQuery free. ZingChart is the last JS charting library you’ll ever need. Whether you’re charting big data or your post-Thanksgiving weight gain, ZingChart blazes. Plenty of flexibility for real time data and interactive features. Plus you can style charts to be beautiful and work on mobile. See how.